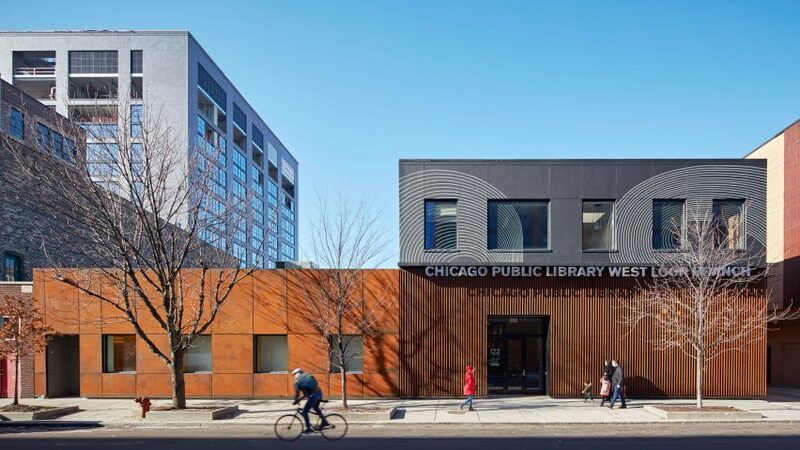 The West Loop Branch library is named after its location in the city's West Loop neighbourhood – a former industrial area that is now brimming with residential towers, office buildings, restaurants and shops – and marks the first public library in the area. Encompassing 16,500 square feet (1,533 square metres), SOM's library occupies two conjoined structures that formerly housed television studios and offices. One structure dates to 1945, while the other is believed to have been built in the 1920s. 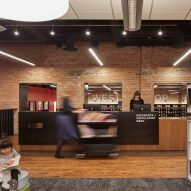 While conceiving the library, the architects sought to retain original elements and respect the site's history. 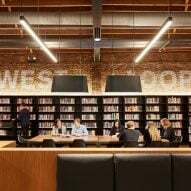 "The two-story, adaptive reuse project preserves the building's industrial character, while creating a new cultural and social centre for the neighbourhood," said SOM in a project description. 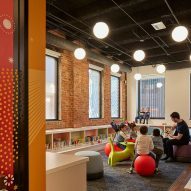 Inside, the building contains a range of programmatic areas, including adult and children's reading spaces, flexible meeting rooms, and a digital learning space for teens with a recording studio. There also is a Tinkering Lab for young children. The architects also exposed elements that were concealed, such as skylights and a series of wooden bow trusses. 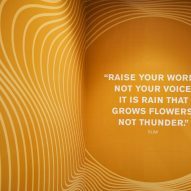 The result is a loft-like atmosphere that "reflects the West Loop's factory-warehouse style". 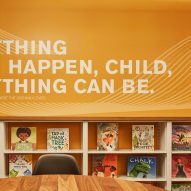 "Wall graphics featuring sound waves woven with excerpts from books selected by librarians allude to the power of words and stories," the team said. The firm also converted a century-old firehouse in the city into a stylish headquarters for the hat maker Optimo. Photography is by Tom Harris.